(CNN) - South Korean President Moon Jae-in has vowed to bolster military defenses at the same time as pursuing diplomatic avenues with Pyongyang, after a historic meeting between envoys from his government and North Korean leader Kim Jong Un. Moon spoke shortly after a high-level delegation held a four-hour meeting with Kim in Pyongyang, the first time that the reclusive leader has met officials from the South since he took power in 2011. North Korea's state-run Korean Central News Agency (KCNA) released photographs of the encounter, showing Kim and his sister, Kim Yo Jong, considered one of his closest confidantes, smiling and laughing. Kim told the South Korean delegation that he wants to "write a new history of national reunification," KCNA said. Another image shows the North Koreans hosting dinner inside the Workers' Party of Korea headquarters, with Kim Jong Un's wife, Ri Sol Ju, also present. It was the first time that South Korean officials had visited the building, Seoul said. A story published by KCNA described the atmosphere as "compatriotic and sincere." South Korean National Security Adviser Chung Eui-yong, who led the South Korean group, is expected to travel to Washington with National Intelligence Service chief Suh Hoon to discuss the trip with their American counterparts after returning to Seoul. Moon struck a cautious note in his remarks later. "We have started our journey for peace and prosperity with confidence that we can build denuclearization and peace on the Korean Peninsula with our own strength," he told graduating students at the Korean Military Academy -- South Korea's equivalent of the US military academy West Point. "But at the same time, we have to do our best to build countermeasure capability for North Korea's nuclear weapons and missiles." 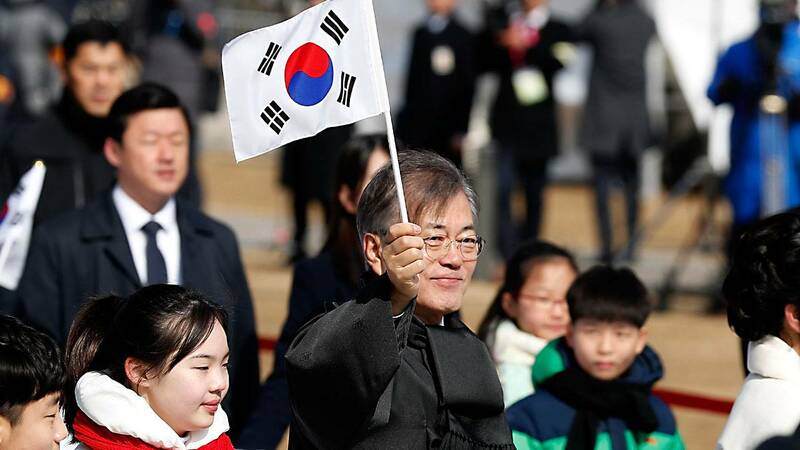 Moon dispatched the delegation after receiving a personal invitation from Kim to visit Pyongyang during last month's Winter Olympics in Pyeongchang. The invitation was delivered by Kim Yo Jong, Kim's sister. Despite the historic nature of the visit, those who closely watch the Korean Peninsula do not see an impending shift in strategy from either Seoul or Pyongyang, but rather two sides trying to play the best hands they've been dealt amid talk of military action by Washington. "Right now the immediate goal of Seoul and Pyongyang is to decrease the chances that (US President) Donald Trump and his advisers will one day decide to strike. And how can you do it? By using your charm and smiles," said Andrei Lankov, a prominent North Korea watcher and professor at Kookmin University in Seoul. Moon's emphasis on both dialogue and military capabilities appears to fall in line with the United States' so-called maximum pressure campaign, in which Washington ramps up sanctions and pressure on North Korea while leaving the door open for negotiation. Trump's administration has said it would be willing to engage in dialogue with North Korea, but has insisted that Pyongyang eventually abandon its nuclear weapons program as part of any talks. Geopolitics aside, Kim Jong Un's meeting with the South Koreans is almost certain to be an intelligence coup, analysts say. Just getting face time with Kim is likely to help the United States and South Korea better understand the one of the world's most mysterious leaders. "They'll be trying to discern Kim Jong Un's mannerisms, his health, his decision-making capability," said Bruce Klingner, a former CIA deputy division chief for Korea now with the Heritage Foundation, a conservative think tank based in Washington. One thing that's apparent from the tranche of images released by North Korean state media is the increasing presence and power of Kim's sister, according to Michael Madden, a visiting scholar at Johns Hopkins University's US-Korea institute and expert on North Korea's leadership. Kim Yo Jong officially heads North Korea's propaganda wing but her political profile has skyrocketed in recent months. She was chosen to lead the North Korean delegation to the PyeongChang Games and had a seat at the table next to her brother for Monday's historic meeting. She was the only woman there. "Kim Yo Jong is a lot more powerful than any of us are giving her credit for ... she is way more powerful than anyone wants to admit in terms of what she's involved in," Madden said. "The whole thing of relations with the South Koreans, that's her thing."